The Active Citizens Book Group! Join us to discuss current affairs in the US and around the world. Future topics will include the environment, racism, economic and gender inequality, and workers' rights. 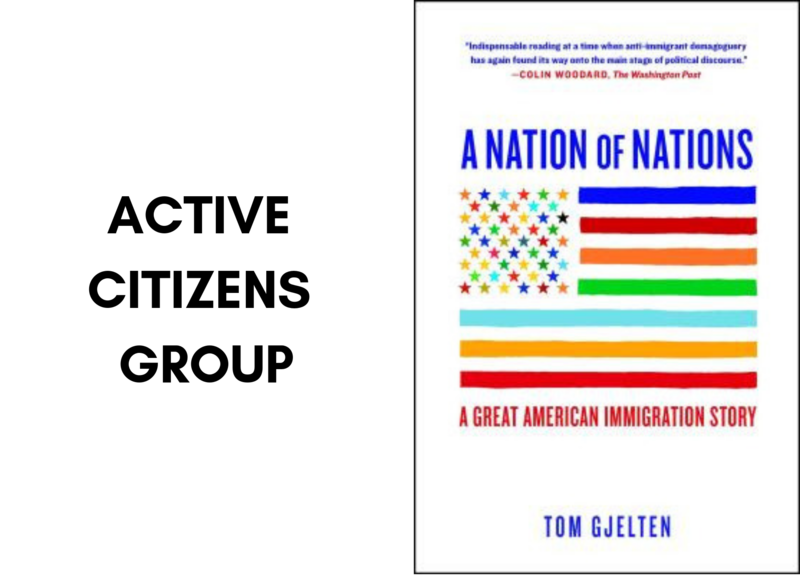 This group meets monthly on the last Sunday of the month, at 4 p.m.
“An incisive look at immigration, assimilation, and national identity” (Kirkus Reviews) and the landmark immigration law that transformed the face of the nation more than fifty years ago, as told through the stories of immigrant families in one suburban county in Virginia. In the years since the 1965 Immigration and Nationality Act, the foreign-born population of the United States has tripled. Americans today are vastly more diverse than ever. They look different, speak different languages, practice different religions, eat different foods, and enjoy different cultures. In 1950, Fairfax County, Virginia, was ninety percent white, ten percent African-American, with a little more than one hundred families who were “other.” Currently the Anglo white population is less than fifty percent, and there are families of Asian, African, Middle Eastern, and Latin American origin living all over the county. “In A Nation of Nations, National Public Radio correspondent Tom Gjelten brings these changes to life” (The Wall Street Journal), following a few immigrants to Fairfax County over recent decades as they gradually “Americanize.” Hailing from Korea, Bolivia, and Libya, the families included illustrate common immigrant themes: friction between minorities, economic competition and entrepreneurship, and racial and cultural stereotyping. It’s been half a century since the Immigration and Nationality Act changed the landscape of America, and no book has assessed the impact or importance of this law as A Nation of Nations. With these “powerful human stories…Gjelten has produced a compelling and informative account of the impact of the 1965 reforms, one that is indispensable reading at a time when anti-immigrant demagoguery has again found its way onto the main stage of political discourse” (The Washington Post).